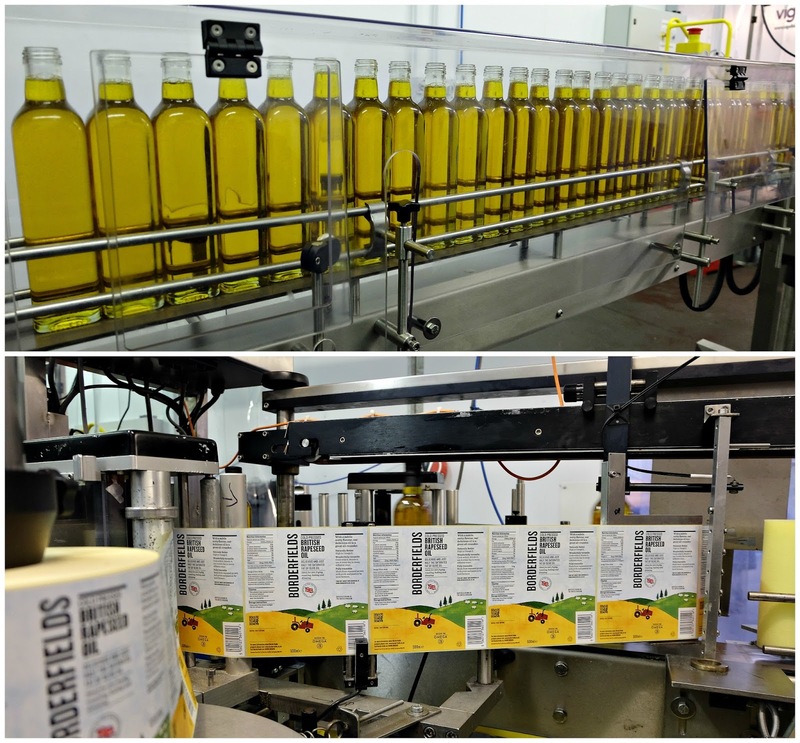 Last week I had the unique opportunity to visit Boderfields' rapeseed oil plant deep in rural Nottinghamshire. For a city girl like me a visit to the countryside is always exciting. 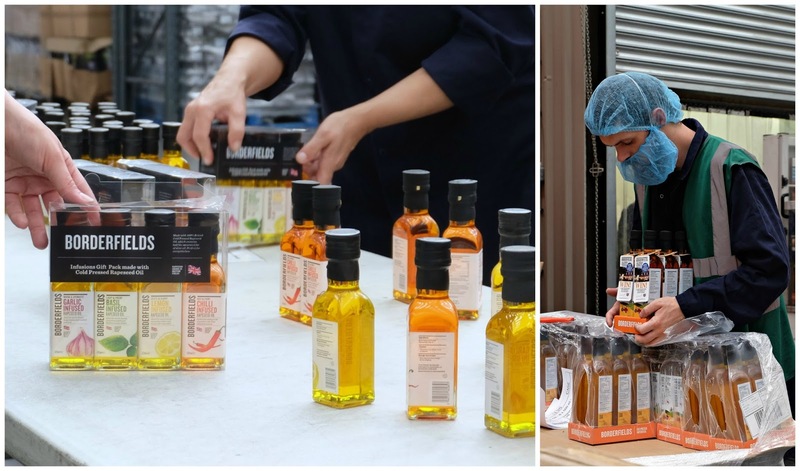 Plus I was curious to learn more about rapeseed oil which is even more healthier than olive oil since it has half the saturated fat and a high smoke point that retains the oil’s natural benefits when cooked. We started early from London's King's Cross station and reached Newark around 10 a.m. in the morning. We had a packed day ahead of us. First we were driven to the plant. 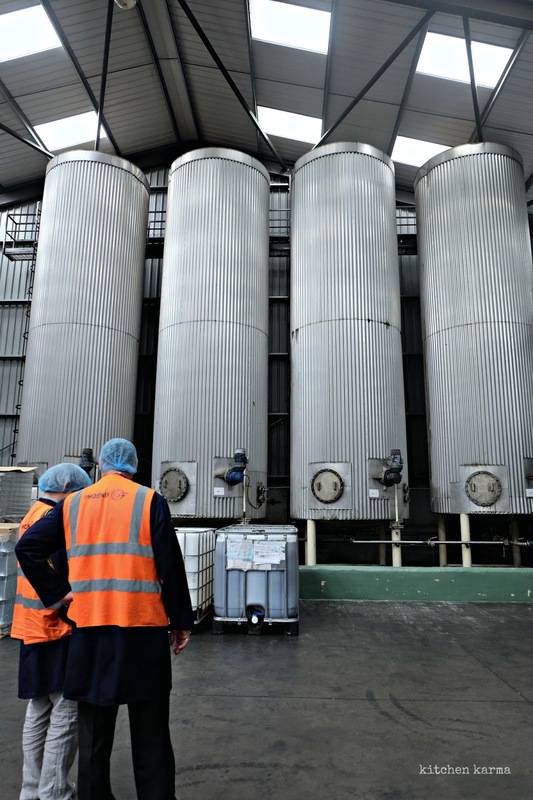 In this plant rapeseeds grown in the UK, are cold pressed and filtered 5 times to produce high quality oil. And then it is bottled and labeled to go out to the markets. We were assured nothing else goes into those bottles. Which is such a relief and a joy in this day and age of nasty chemicals and lurking preservatives. Before we went into the factory floor we were given an introductory talk about how back in 2005 a cooperative of British farmers came together and Borderfields was created. Today it is the biggest cold pressed brand in the UK. Many of those farmers still grow the rapeseed used by Borderfields and because, unlike many producers, Borderfields use rapeseed grown across England and Scotland, they can ensure a consistent, high-quality product in the face of uncertain weather and growing conditions. 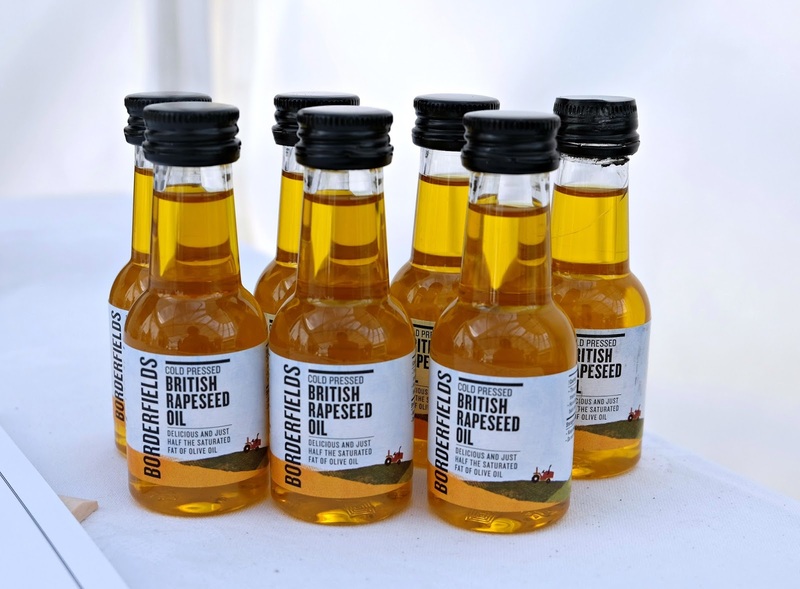 Since they started the demand for rapeseed oil has been going up and they have been producing more bottles every year. Of course endorsements from celebrity chefs help tremendously. Before entering the factory we were made to take off all our jewellery, wear safety clothing & hair nets and sanitise our hands. Finally we were ready to enter the plant floor. They work the plant in shifts, while we were there morning shift was on in full swing. 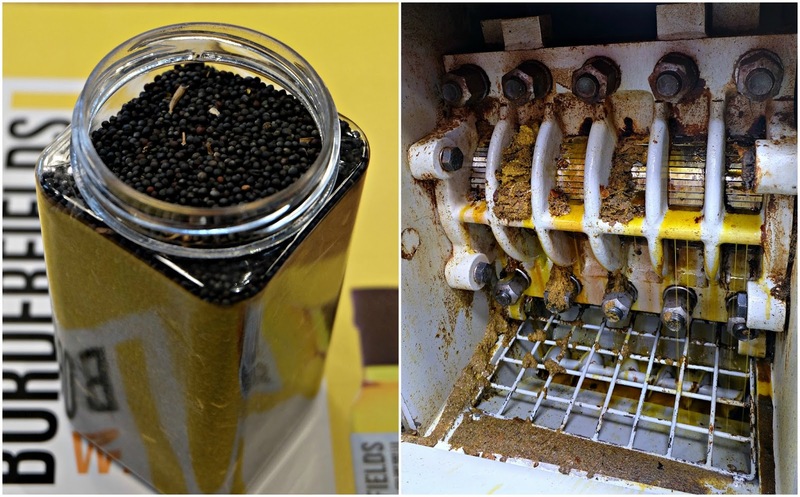 That is rapeseeds being cold pressed for oil, the brown bits are the residue of the seeds after they have been pressed. The seeds remind me of mustard seeds, maybe these are slightly smaller in size. Back home in Kolkata we use a lot of mustard oil and there used to be small workshops which would cold press mustard oil, I remember people would bring their own jars from home and would stock up on freshly pressed mustard oil. Those days are long gone, now it's all sold bottled. This plant took me back to those hazy memories of mustard oil workshops. I wonder if rapeseeds can be used as a spice like the way we use mustard seeds? I am very tempted to give it a try one of these days. It was interesting to know that the residue after the cold pressing is done is feed to the pigs, so there is no wastage at the plant. In the bottling section of the plant. It's fascinating to watch the bottles come out in a row in this machine, are filled up, weighed and capped and these stickers are pressed onto each bottle. Final part of the tour the packaging section. The bottles are packed by hand and are ready to hit the stores. After the tour of the factory, where we got in the way of the workers who smiled politely and indulgently at us, we were taken to Borderfield's garden of innovation. 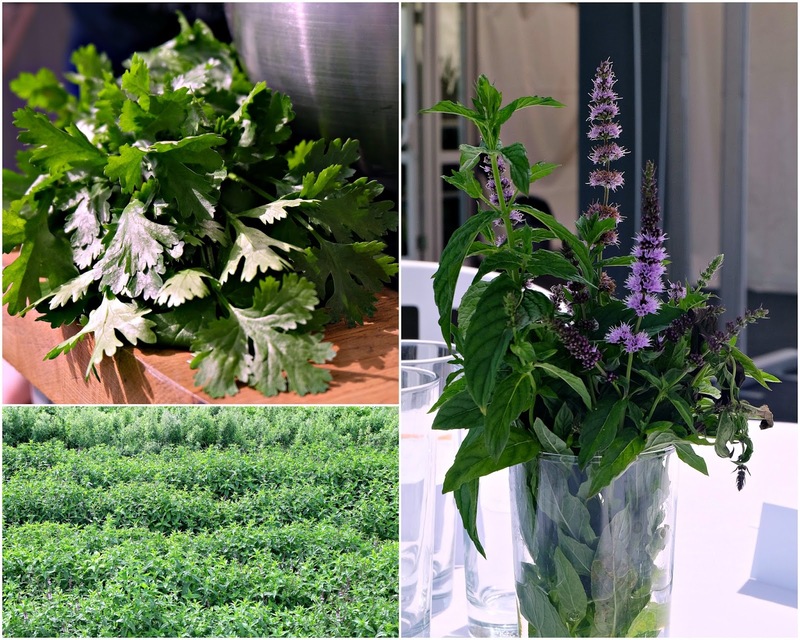 It is a pop-up garden where they grow various kinds of vegetables and herbs. The garden is truly breathtaking and the sheer number of vegetables being grown is mind boggling.They have been using the garden to educate school kids about vegetables and teaching them about healthy eating choices. 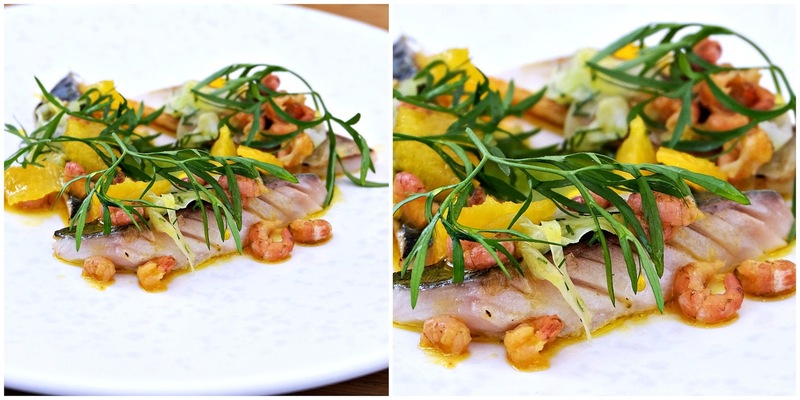 But before exploring the garden we were served a scrumptious lunch all cooked with Borderfields rapeseed oil. 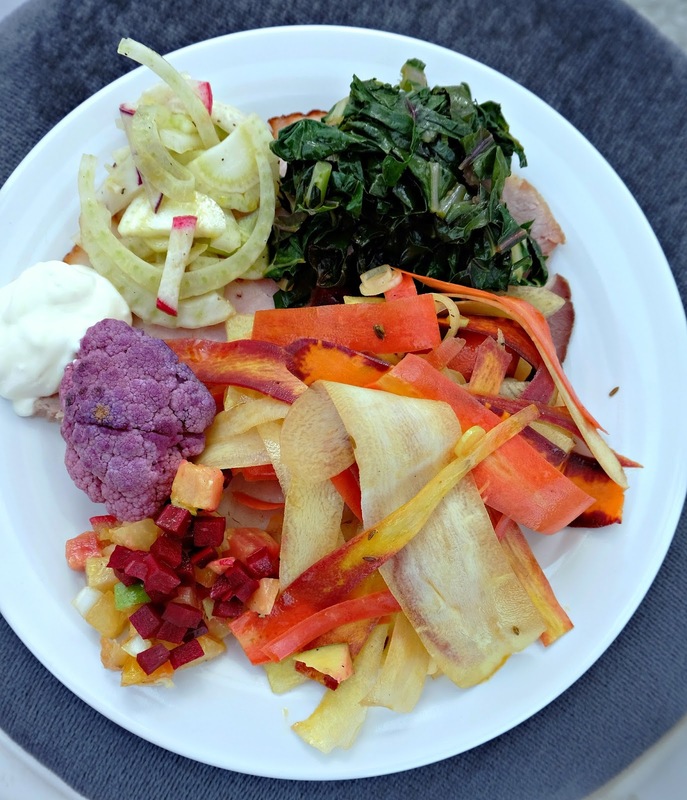 There was honey glazed roasted ham and various kinds of salads and purple cauliflower. My favourite was the beetroot and apple salad. Jon Hammond a farmer and a shareholder in Borderfields kindly showed us around the garden, talking about the different kinds of vegetables they are growing. What works for the UK consumers, what doesn't. They have started working with the big super markets in supplying vegetables. Never in my life have I tasted so many fresh veggies plucked right off the fields. I absolutely loved this tour. Jon's passion came right through. It was a scorching hot day and the sun was right on us, but Jon seemed oblivious to any of that. He happily lead us around the garden, explaining the various veggies they are growing, urging us to taste the different bits and bobs. Sometimes a veggie would have three/four different varieties, Jon would explain what is the unique taste of each one, how they are different, which one will sell best. My absolute favourite bit of the garden was the herb patch. It was lush to say the least and the herbs were the fresh-est I have ever come across. I brought home a bunch of coriander and mint and used them like I would use gold foil. Our day wasn't over yet. 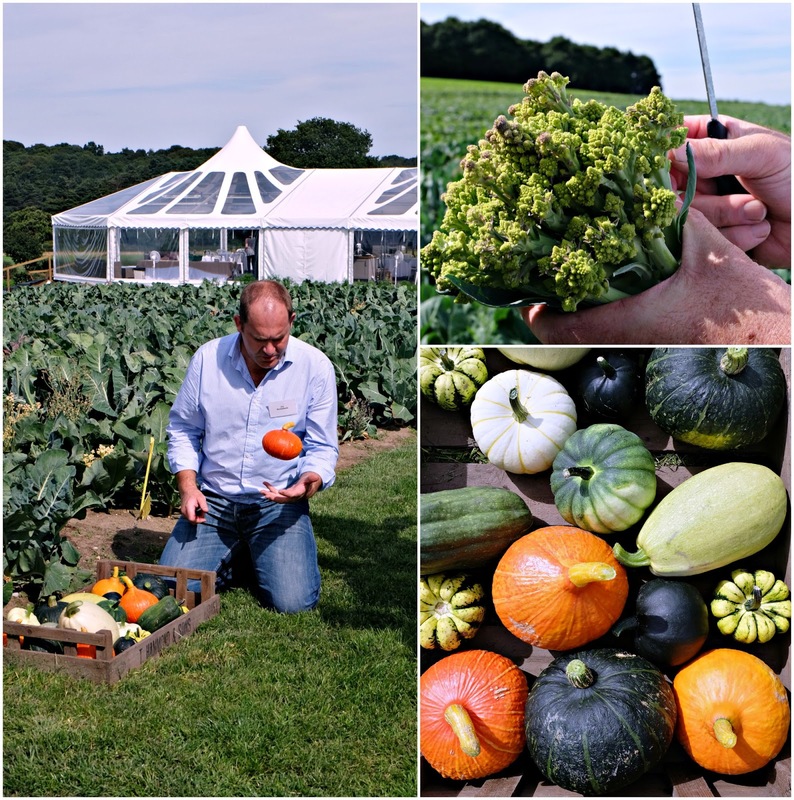 Once we were done with the garden, Michelin starred chef Kenny Atkinson was waiting to give us a cooking demo with some of the garden produce and of course Borderfields rapeseed oil. 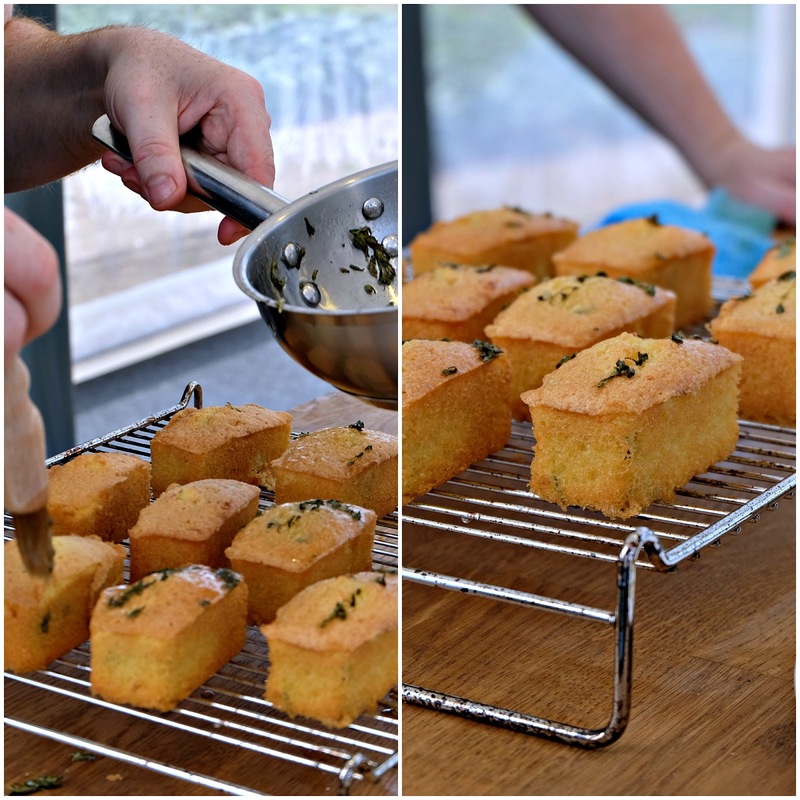 It was a joy to watch the chef expertly whisk up some basil infused mayonnaise, bake a batch of rosemary and lemon drizzle cake and grill Mackerel with bits of orange & brown shrimp. At the end of it we were so stuffed that we swore we won't eat anymore for a few days. Of course that promise did not stick. A massive thanks to everyone who worked so hard to make this tour so enjoyable and informative. I sure had a lovely day and it was great to know where some of my food comes from. More photos on Kitchen Karma's Facebook page.